The determination and perseverance of Vaughn Groenewald was rewarded again in a long and frustrating career, writes MIKE GREEN in Compleat Golfer. It’s almost a pity: a great nickname like ‘The Boom’ should belong to someone who gets raucous fans screaming as he tees off. But it belongs instead to a much gentler soul. Vaughn Groenewald will forgive us for saying he is not really that guy who gets the fans shouting loudly enough to irritate the myriad haters of the ‘geddinthahole’ crowd. As will his four-way playoff victory at the Sun Wild Coast Sun Challenge in Port Edward in August, two years after his last win. Groenewald is nothing if not persevering. That win at Mooinooi was his second of the 2006 season after he had won his maiden Sunshine Tour title five months earlier at the Vodacom Origins of Golf event at Pretoria Country Club. They seemed to finally be vindication of his decision to turn professional 11 years earlier, in November 1995, and should have heralded a lot more. After all, he had endured a tough start to his career, breaking into the top 50 of the Sunshine Tour Order of Merit only once during his first 10 years on Tour. He had his first runner-up finish on the circuit only in 2000, and he presaged his maiden victory with a share of third at the 2005 Vodacom Origins of Golf at Pretoria Country Club. But despite those 2006 successes, it took him nearly six more years before he produced another runner-up finish on the Sunshine Tour. And frustratingly, it was a further three years before he won again, taking the Zambia Sugar Open in Lusaka in 2015. ‘My win in Zambia was my biggest on the Sunshine Tour, getting me into the Mauritius tournament the week after,’ he says of those crazy few days when he had to make his way to the kind of event he would not ordinarily have expected to play, based on his performances. ‘It did take a while for it to sink in, but it gave me extra confidence, knowing I can win a lot more tournaments,’ he says. He did that well enough, at the Sun Wild Coast Sun Challenge four months later. His celebrations, though, remained sporadic; winning only once in 2016. So how did he manage to keep things going through what must have been some depressing moments? ‘I have been a professional for 23 years and I’ve learned a lot,’ he said. ‘I’ve had many ups and downs where I learned from the mistakes I had made. I have been up there a couple of times and my experience helped me through all the tournaments. ‘I have always had the belief and I have always known that I had the talent to become a successful player on Tour. It was just a matter of time before I was going to win again, but I knew in my heart of hearts that I was going to win. ‘Yes, the wait and having to stay patient made things tough because I got so close to winning. I tried to stay positive by focusing on the experience I gained from each tournament, no matter how I did. The most important thing was that I always wanted was to keep positive and believe. Part of Groenewald’s rejuvenation came about in a complete change of scenery. The man who had played his whole professional life out of Ermelo took note of the kind of changes that were being made by fellow professionals like Wallie Coetsee, who had moved from small towns to substantially more appealing golfing – and living – centres. 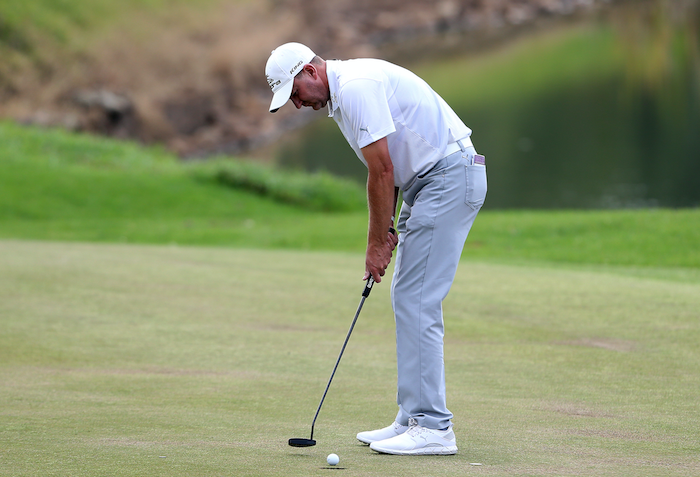 Groenewald pulled off his sixth Sunshine Tour victory in August with a spectacular 61 in the second round, keeping in touch with the top of the leaderboard during a low-scoring week. It was due in no small part to experience, he says, in reference to the emergence of a generation of younger players who have made winning a little tougher than it used to be. ‘It’s great having all the new youngsters on Tour, but my experience still counts for a lot,’ he says. That background, together with the experience he has built up in European Tour and Asian Tour events played in South Africa, will stand him in good stead as he approaches the latter half of the 2018-19 Sunshine Tour season. He’s inside the top echelons of the Order of Merit (20th as at 10 September), and he knows he will win good money before the end of the season. Because he’s been so assiduous in learning his lessons during a long, hard career, he has a wellspring of skill and resilience to draw on when the going gets tough – as it always does. And you can be sure there will be a moment when Groenewald will sink a crucial putt, maybe even win again. And, quietly, he will say to himself, ‘Boom!’. 2 – The number of career holes-in-one recorded on the Sunshine Tour. 6 – Sunshine Tour victories, spanning 2006 (two wins), 2015 (two wins) and 2016 and 2018. 12 – Consecutive number of cuts Groenewald has made in tournaments on the Tour. 57 – The number of top-10 finishes he has in his career on the Sunshine Tour. 61 – Groenewald was 43 when he shot the best round of his career, at the 2018 Sun Wild Coast Sun Challenge, in the second round. R5.7million – Career prize money he has won on the Sunshine Tour.